Growing up in New England, gin and tonic is the classic summer drink. It’s bracing, fresh, cool, and not overly potent. The joke was that they tasted like after-shave lotion, but to be honest, most after-shave lotions smell pretty good. Often they’re scented with lime or something mentholated, at least they did when I was a kid and smelled them at the barber shop. That makes the taste of gin and tonic a Proustian memory for me. Another memory that I have that’s less pleasant was the first time I tried alcohol. I was perhaps eight years old and saw a bottle of whiskey that my parents had on hand. And since they, and their friends, drank it, I thought I would give it a try too. I unscrewed the top and took a big swig of the brown liquid. Within about three seconds, my mouth was on fire and my throat was assaulted by an unfamiliar, and unwelcome, burn. Once I had recovered, I couldn’t imagine drinking alcohol ever again. Now that I’m an adult, and above the legal drinking age, I don’t chug liquor like I used to (thank goodness! ), but nothing tastes as good to me now as a cold gin and tonic on a warm summer night, when a regular, overly boozy cocktail would knock me out cold. I had lunch with a good friend that I used to work with the other day and she was saying that she doesn’t like all those cocktails will all sorts of different things going on in them. She just wants a regular, straight-up cocktail. I agreed (and perhaps pulling out my age card), thought aloud that maybe when you get older, you stop being impressed by all those tricks and twists in food and drinks and just want to go back to the original. Which is why the classics endure. Gin and tonics only have three ingredients, if the literalists don’t include ice. I grew up making them with Tanqueray gin, and we’d just call them Tanqueray and Tonics when I was back in New England. But now there are a lot of gins out there and I found this organic bottle which I’ve been working my way through. It’s made in Minnesota. There are lots of botanicals in gin, but the only one that it has to have is juniper. However some have all sorts of herbs, berries, and leaves in them, from lemon verbena to hibiscus and thyme. So people tend to gravitate towards certain gins for that reason and there are lots of small-batch gins that I’m seeing, even a gin distilled in Paris. The tonic water is important, too, and a few years back when it became available in Paris, I switched to Fever Tree tonic, which tastes a gazillion times better than the commercial stuff. Other brands have now joined it on the shelf, and I’ve been making my own tonic water, but I had a few bottles leftover so used one of them for up making a recent evening’s libations. There aren’t a lot of rules to making a gin and tonic, and thank goodness, because who wants to fuss too much when there is a tray of drinks almost ready to be consumed? Some fancy a few cucumbers in there, and I’ve tried them with fresh mint, which didn’t win over this cocktail curmudgeon. But you can do as you please, since presumably, you’re an adult. (Unlike the 8-year-old me, who bypassed the mixers and was, even back then, a purist.) You do need limes, though, since that is the crowning touch on this cocktail, which has become my summer sipper of choice. The brand of gin is a personal preference, but do spring for a decent one; you’ll appreciate the difference. 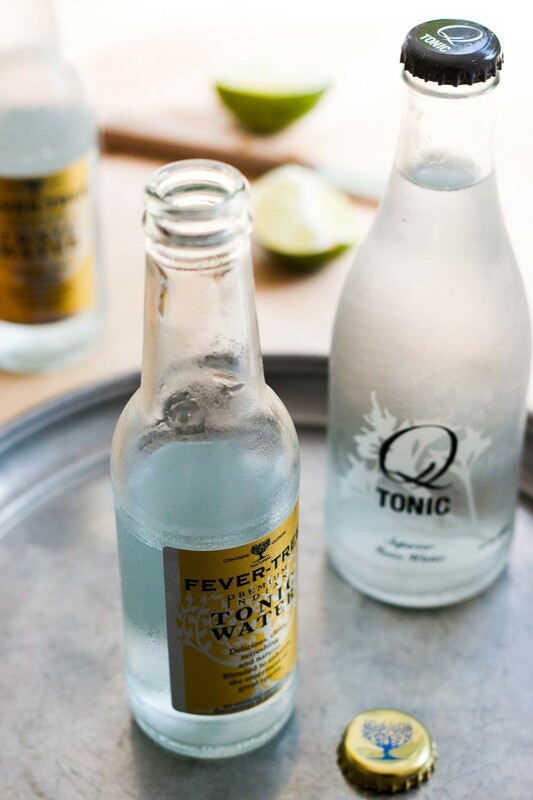 I definitely recommend using a good brand of tonic water, such as Fever Tree, Fentiman’s or Q. For a special treat, try making your own homemade tonic water, which will give the drink a distinctly amber color. The amount of gin is a personal preference, and depends on the actual size of the glass. Some say 1 part gin to 2 parts tonic is right, but you can customize to your liking. 1. Fill a tall glass with ice cubes about 3/4’s full. Add the gin to the glass. 2. Squeeze the lime wedge gently over the gin and ice cubes, just to release a small bit of the juice, but not all, then drop the lime wedge into the glass. 3. Fill the glass up with tonic water. Stir gently a couple of times, and serve. Forget about the lime – use a slice of bitter lemon instead. That’s intriguing and sounds tasty. I tried to find more about them online and couldn’t. What kind of lemon is it that you slice up? Most lemons I’ve found are Eurekas or Meyers, which are tart but not entirely bitter. Just the bog standard lemon found in British supermarkets – I’ve never looked at the variety but they mostly come from Spain. From reading about Meyer and Eureka lemons, I suspect they are most like Eurekas which I guess most people wouldn’t want to chew on. I dug around a bit more and I found that the varieties most frequently grown in Spain are Verna (70%) and Fino or Primofiori (20%). These are of unknown origin or Spanish origin. These do not seem to be the same as Eureka or Lisbon varieties. Looking at pictures of these two varieties, the one most commonly seen in British supermarkets seems to be the Fino/Primofiori. It is claimed to be of high juice content with high acidity and a thin skin. Reading this reminds me how much I love gin and tonics. I hope I can find some of the tonics you mentioned. I am visiting Paris from Michigan next week. The dried tart cherries are plentiful this year. Would you like me to bring you some? I’ve never tried any of those small-batch tonic bases but they sound like a good idea, as well as saving on space and carrying bottles home! Stir ? Isn’t it better to preserve the bubbles ? A few brief turns with a spoon to mix the ingredients usually isn’t enough to get rid of the bubbles in my experience, but it a good idea to combine the gin and tonic together, so you’re not left with all the gin at the bottom of the glass. Ah, love a good G&T and have yet to have one this summer, gotta fix that before it’s all over. I totally agree about the lemon and have done the G&T sans lime when I’ve run out, or forgotten to get one, and yes, it’s happened to me more than once. Good yes, but not nearly as good as with the lime in it. Nice! I just had a gin & tonic last weekend & do plan to try it again soon. First time in years. We had a 6 pm toast, & it did go down well after a day in the heat & a game of badminton. Try using Uncle Val’s Botanical Gin for the BEST gin and tonic you will ever taste! Thanks, Nancy. I’ll look for it. My husband and I agree with you 100% on how to make a G&T. The tonic makes a big difference – fever tree or Q are great. if you use Jack Ruby be sure and read the directions and dilute it. I may try your tonic recipe. Thanks for another great article and if you are in New Mexico, stop in for a drink. I like to add a splash of St. Germain occasionally. Have also switched to G+T in the last couple of weeks. It is the quintessential summer drink. my wife has not transitioned from her beloved Micheladas yet, so there is a lot of mess at drink time. Fever tree is great, enjoy the Jack Rudy, Plymouth Gin is terrific for these since it downplays the juniper a bit, kind of makes it easier to have a couple. Thanks, i really enjoy your posts….the strawberry jam was simple and insane! I really don’t like GIN. Thanks for the promo for the Minnesota gin. It’s pretty awesome. I really like a G&T with a dash of bitters. Orange bitters is very nice also. David, when you’re back in the Bay Area grab a bottle of the locally brewed Rusty Blade gin (sold at places like BevMo, Whole Goods, Andronicos, Draegers). It’s fantastic with Fever Tree Naturally Light Indian Tonic and a wedge of lime. “Rusty Blade” is a single barrel Blade Gin specially aged in French Oak. It features Juniper and citrus notes with aromas of baking spice, cloves, a hint of Vanilla and a rounded mouth feel. Typo alert: “Some day 1 part gin to 2 parts tonic…..” …did you mean “say”? When I have really good gin, I might even reverse that proportion. And yes, I discovered both Q and Fever Tree a few years ago and there’s absolutely no turning back to supermarket tonic! I can’t wait to try your homemade tonic recipe. Gin, tonic and elderflower is still very good! In previous years I’ve made Elderflower vodka. It’s too late for this year, but you could make Elderflower eau-de-vie, or even Elderflower gin? 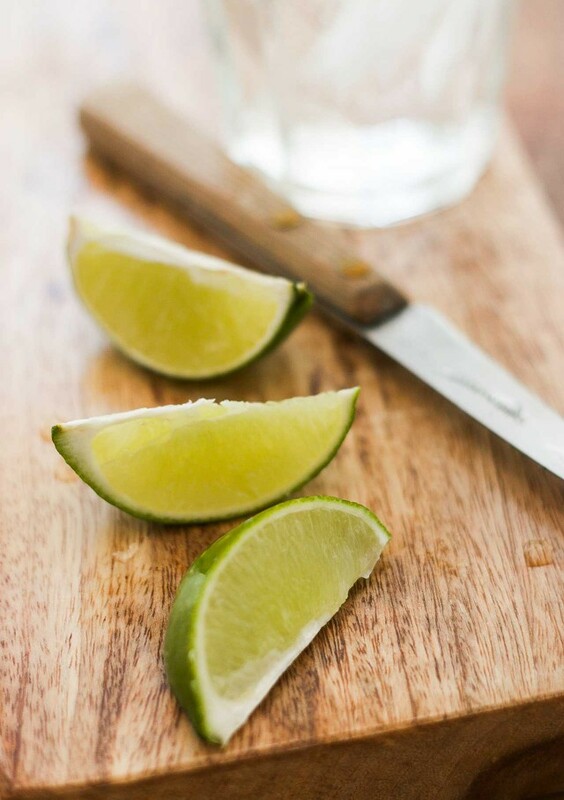 Just a quick swipe around the rim of each glass with the cut lime is a nice trick. Introduces the lime scent and flavor at the moment of your first sip. Husband and I keep several brands of Gin in the house. We like Tanqueray Rangpur for a nice change. Hendricks is great with cucumber rather than lime and Bluecoat is nice with a bit of St. Germain. David, though, you are correct; nothing says summer like a G+T! I love a good G&T. In London we’re lucky to have several small batch distilleries and even a small batch tonic water company, BTW (http://www.btw-drinks.com/). My current favourite gins are Blackwoods 60% from the Shetlands and Pink Pepper gin, which is made in the Cognac region by an Aussie. 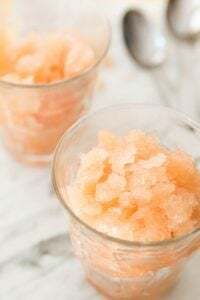 Pink Pepper is great with a twist of pink grapefruit rather than lemon or lime. You should try it-I think its available in Julhes. Try a gin and sonic, which is half tonic and half soda water. Lighter and with fewer calories. You cannot tell the difference. Intriguing! Thanks for the idea. Yes, intriguing. Will have to try it! Is Q tonic available somewhere in Paris? Fever Tree is great and easy to find, but Q tonic was always my favorite when I lived in Seattle. It would be fun to find it here. 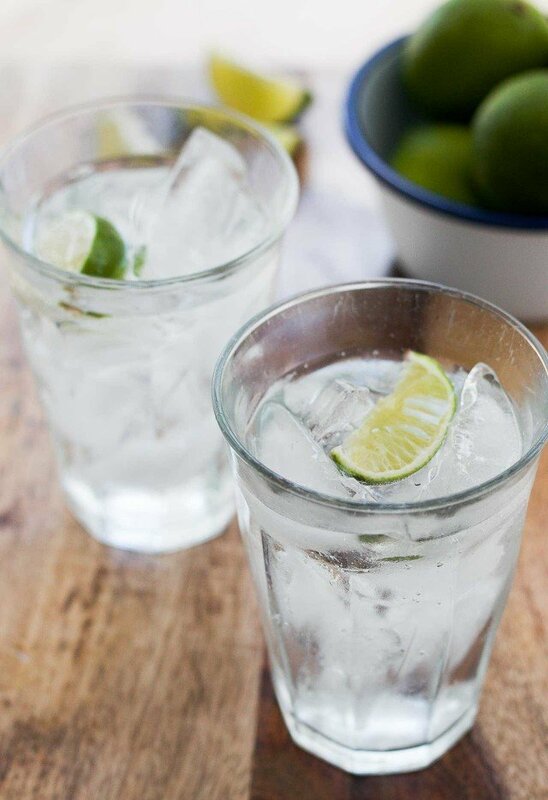 I love gin and tonics, and I think they should be made with Beefeater gin and Schweppes tonic, am I a purist or too simple? Absolutely not! 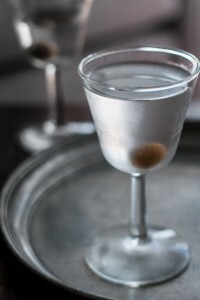 Cocktails should be enjoyed the way you like them and there’s nothing wrong with Beefeater gin, or other standard brands. Enjoying a cocktail is also about the experience – I’ve had great cocktails made by bartenders (and myself) with everyday liquors and mixers. Agree totally about the Schweppes tonic water, much better than the other boughten ones available around here. My son and I enjoy G&T as a pre-dinner pickmeup — and a fine tradition it is, too! 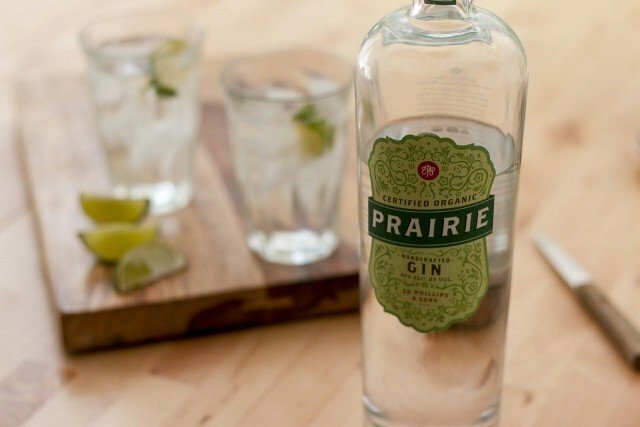 I do want to look for some of the handmade tonics, although suchlike are often hard to find in Ontario. If there are any Ontarians on the board who can correct or direct me, I’d love to hear it! Yes, I am also a bit intrigued about the different kinds of tonic water. Will try some and see, might even try some other kinds of gin, fun to try! Sylvia, I’ve had the advice that if it’s difficult to find other tonics than the sweet ones like Schweppes cut it with soda water; 1 part sweet big brand tonic to 2 parts soda water. Yes, a fine tradition it is! It’s my fav too. 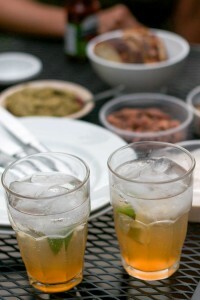 In spring, I make a rhubarb G&T with a little rhubarb syrup ala Mario Batali. tried making a cold brew tonic with store bought tonic (who am I kidding, it must be schweppes) and the results were pas terrible! Gotta find some decent tonic in Paris! Agree on the importance of good gin and good tonic. If you like the elderflower, try Fever Tree’s elderflower tonic, which is perfect for a fresh summer evening. Oh, I *adore* Fever Tree tonic! I just discovered it a few months ago when I was the designated driver one evening and ordered a straight tonic water. Couldn’t believe I was drinking tonic water so tasty! I’ve been trying different gins as well– Hendricks is good, of course, and I’m currently in the middle of a bottle of Few, an American gin, but my favorite still is Tanqueray No. 10. It tastes completely different from the standard Tanqueray and, no matter how many gins I try, I always come back to its clean citrus taste. My favorite G&T ever! I’ve been hooked on gin and tonics for a while and like to try out all kinds of gin to mix in. When I first started out, I thought gin was just gin and all were similar. I was wrong. Now I have about 10 different gins and they all have their own thing going on. Hendrick’s is well known and is great with cucumber and splash of rosewater. Most other gins I use lime with Fever Tree tonic. If you’re in Pennsylvania, you can find Blue Coat gin made in Philadelphia. Very unique. Lots of distilleries popping up here and makes for an exciting time with new things to try out and experiment. I haven’t had a G&T for many many years – put it on my list. Have you tried Dubonnet with tonic? 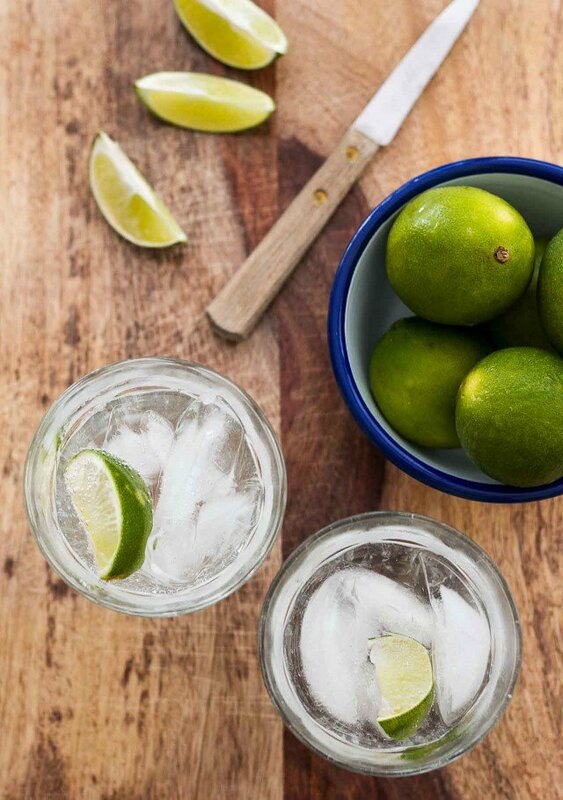 One of my friends loves those and we always have them at her house in L.A.
We love G&T’s around here and your ode to our favorite is fantastic. Hendrick’s is our favorite (probably because they carry it at Costco and we’re fancy that way). At first I thought you were crazy, how could tonic make that much of a difference? I put it to a test tonight and Wow! What a difference the Fever Tree tonic makes! The G&T is so smooth. You, again are a genius! Thank you for sharing your knowledge! I like mine with olives. Lots of olives. And I poke little holes in ’em and eat (most of) them last, after they’ve soaked up the goodness from liquids. I am a no lemon or lime girl. I try not to insult the gin, LOL. I also prefer high quality tonic water to go with my very good gin. And always have ice – I live in Australia. In any event, I agree with you that the tonic makes all the difference. I’ve pretty much given up G&Ts here in the UK (unless I make them myself) because all the standard tonic water contains aspartame. Talk about a horrible taste experience! Not to mention the headaches, and that’s not even because of the booze. And speaking of gin, I aspire to have a cask of negronis after reading your post yonks ago. Do you still have one on the go? I was 8 days into a 21 day booze free cleanse and after reading everyone’s comments about G&T’s I fell off the darn wagon. Oy! If you can find it, there is a new gin made in Minnesota. Small batch. Solveig. Made by Far North Spirits. The St. Germaine is very nice in the G&T! Thanks for the tip. That looks delicious. Perfect for a hot day. This post coincides perfectly with my first G&T ever, just last evening, made with Fever Tree Bitter Lemon. ! I love gin, but it had been a while since I had had a gin and tonic. Last week we went to Black Bull, a tapas restaurant in Chicago with a chef who I think is Catalan (or maybe Valencian?) but credits his years cooking in Castilla-La Mancha, and deserves credit for maintaining a fair number of familiar pinchitos and tapas on the menu along with his own dishes. But back on topic, our server explained that gin and tonics were a big thing in Spain, so the chef wanted a nice selection on the menu. They were all served in goblet glasses, made with various Fever Tree tonics and paired gins. They also all were a bit over the top in terms of garnishes, but I enjoyed mine with sliced grapes and a sprig of rosemary, and my wife very much enjoyed her’s with grapefruit peel and a sprig of mint. They were fantastic bitter, crisp apéritifs before a meal featuring plenty of Spanish cheeses and some wonderfully fried items on a somewhat warm, humid summer evening. I just terrified myself by how quickly and easily a conventional G&T (Bombay, Schweppes and lime) went down as I was reading this. Luckily I went easy on the gin and was able to take the dog out for a walk without incident! A quick search tells me that I’ll be stopping in at Merz Apothecary to pick up some chinchona bark this week and tracking down organic citrus to make a batch of tonic water! Discovered Fever Tree a few years ago and agree with you and the comments — it’s delicious, especially the Naturally Light! Just discovered a gin, The Botanist. It’s from the Isle of Islay, Scotland. Lovely, fresh and clean. With a wedge of lime, it’s they make for the perfect Cape Cod summer G&T!